Some users have reported encountering “Port in use, please wait” error message, while trying to print to a printer attached to their computer. 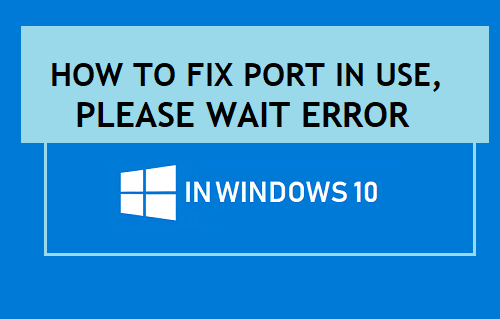 You will find below the steps to fix Port in use Error in Windows 10. In general, “Port in use, Please wait” Error message appears while trying to print to a printer attached to the USB port of a computer. The error message does not go away, even if you try again or wait for a long time. However, if you try to print wirelessly from an iPhone or Android Phone, the same printer works perfectly well. This narrows the problem to a possible communication error between your computer and the Printer. 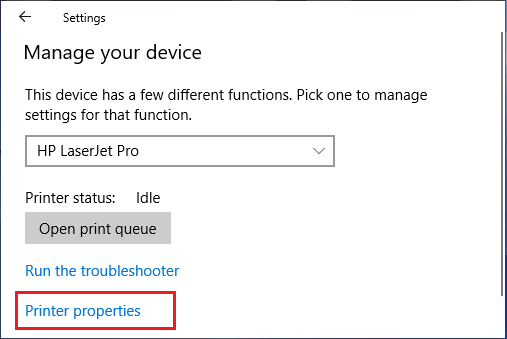 So, let us go ahead and take a look at some of the methods to fix “Port in Use, Please wait” error in Windows 10. If the problem is occurring due to a minor software glitch, restarting the computer and printer should fix “Port in Use” Error on your computer. 1. Power OFF the Printer and Unplug it from your computer. 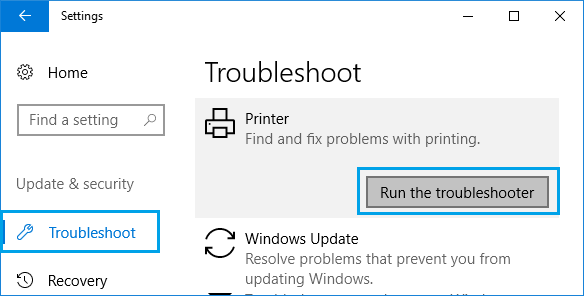 You can trust the in-built troubleshooter in Windows 10 to find and fix printing problems on your computer. 2. Next, click on Troubleshoot > Printer > Run the Troubleshooter. Wait for the Troubleshooter to find and fix printing problems on your computer. Follow the steps below to make sure that the correct type of Port has been assigned for your printer. 1. 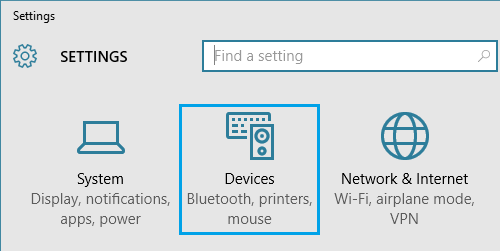 Open Settings > click on Devices. 2. 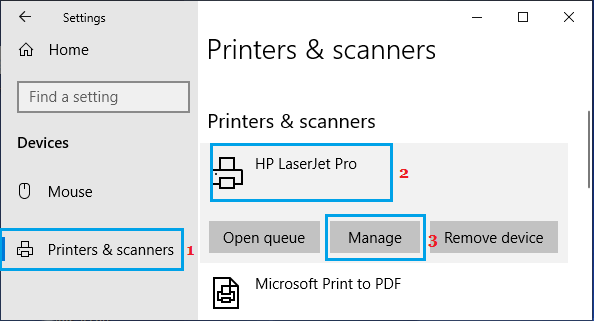 Next, click on Printer & Scanners > Printer Name > Manage. 3. On the next screen, click on Printer Properties link. 4. 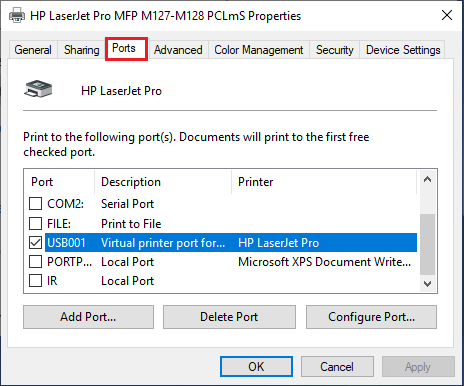 On the Printer Properties screen, switch to Ports tab and make sure that the selected printer port type matches the connection that is currently in use. If the printer uses a USB connection, the Port should have a USB in the description. Similarly, if the printer is using a network connection, it will have Network, or IP in its description. If you are not sure, refer to the User Manual that came with your printer and it should have some instructions or reference to the type of Port required/supported by the printer. Printer Problems can also be caused due to the Printer device driver software being incompatible with the version of Windows OS running on your computer. 1. Right-click on Start button and click on Device Manager. 2. 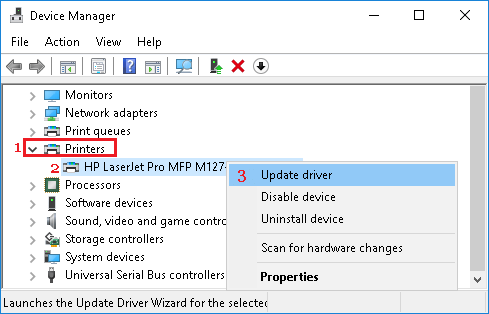 Expand Printers Entry > Right-click on the Printer Name and select Update Driver option. It is possible that “Port in use, Please Wait” error on your computer is due to USB device driver being outdated. 1. 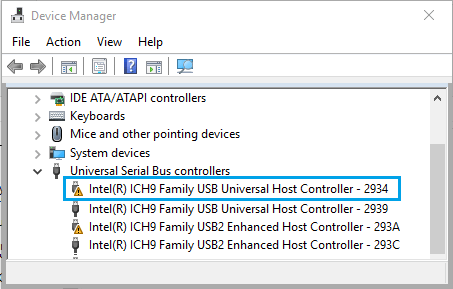 Open Device Manager > Expand Universal Serial Bus Controllers Entry > Right-click on the USB Controller with an exclamation mark and click on Uninstall in the contextual menu. 2. Repeat the above steps for other USB Controllers with Exclamation marks. Once your computer restarts, Windows should automatically load the right drivers as required for USB Ports on your computer.